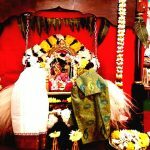 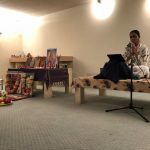 On the evening of Saturday Oct 27th 2012, a Madhura Smrithi was organized in the community hall of an apartment community in the Minneapolis neighborhood. 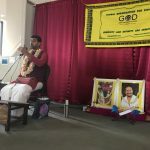 Devotees from various parts of the country had gathered for the house warming ceremony of Sri.Murali and Mrs.Priya Murali there had a wonderful treat awaiting for them. 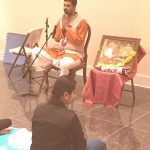 Sri Ramanujamji gave a “Madhura Smrithi” discourse – his blissful experiences with Guru Maharaj. 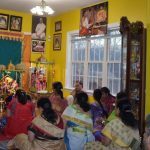 Through various episodes from his own life, Sri Ramanujamji beautifully brought out the greatness of the Lord and how accessible he becomes when he descends down as a Guru and touches our lives. 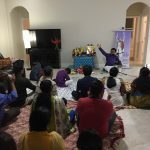 The very heart-touching narration went on for over 120 minutes with devotees feeling very reluctant to part company from the Satsang, longing for more of the divine nectar.